Hello friends! In less than a week Christmas will be here. Are you ready? As for me, I’m getting closer since I finished decorating the dining room. 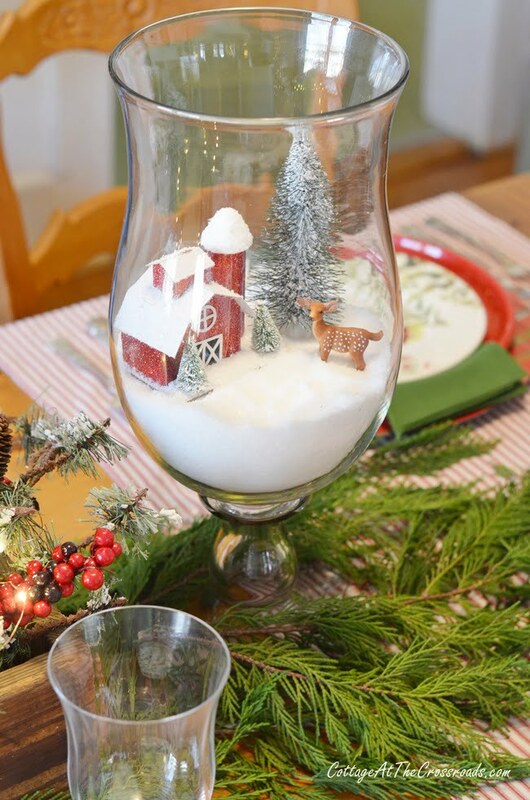 Today I’m sharing my red barn Christmas tablescape. I’ve always had a thing for red barns, mainly because we had a red barn at the farmhouse where I grew up. I have lots of memories surrounding that old red barn so you can understand why I’m all nostalgic. 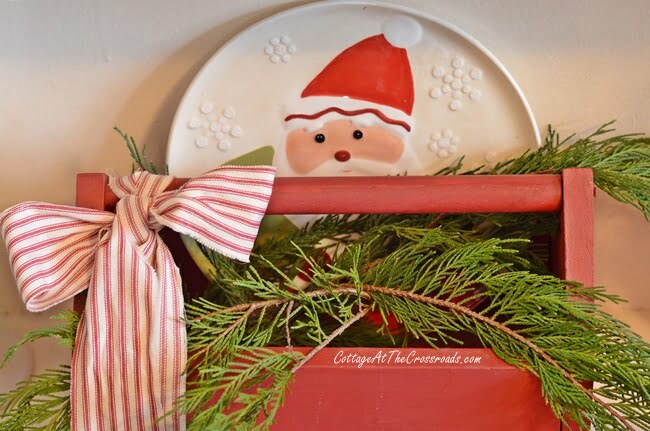 I really wasn’t planning on centering my Christmas tablescape around red barns but one day my blogging friend Pam from From My Front Porch to Yours posted some Christmas plates on Facebook. The plates had a red barn on them and I instantly fell in love! The accent plates are part of the Southern Living line sold exclusively at Dillards and before I knew it, I was in Dillards purchasing 8 of them! 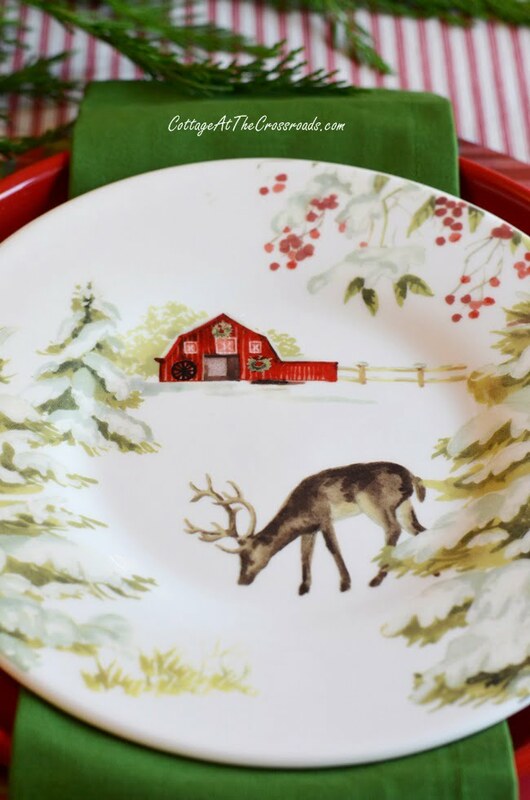 After I purchased the plates, I found these adorable red barn Christmas ornaments at Walmart. I bought all that my local store had. And they led to getting a new, skinny flocked tree to put them on! For quite a few years, I have been wanting a small tree for our dining room. At the top is a red barn lighted picture that was gifted to me by the owner of Taylor’s Garden Center where we purchased the new tree. 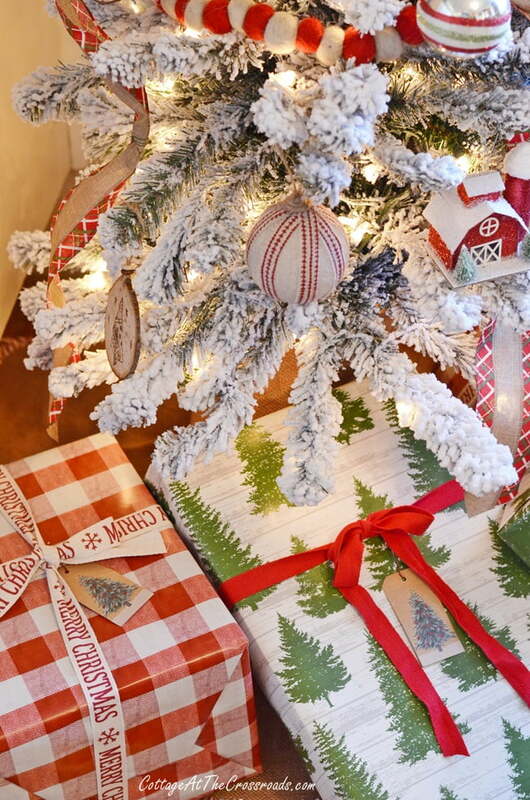 The packages under the tree match the traditional red and green colors that I used in the dining room with the red barn Christmas tablescape. 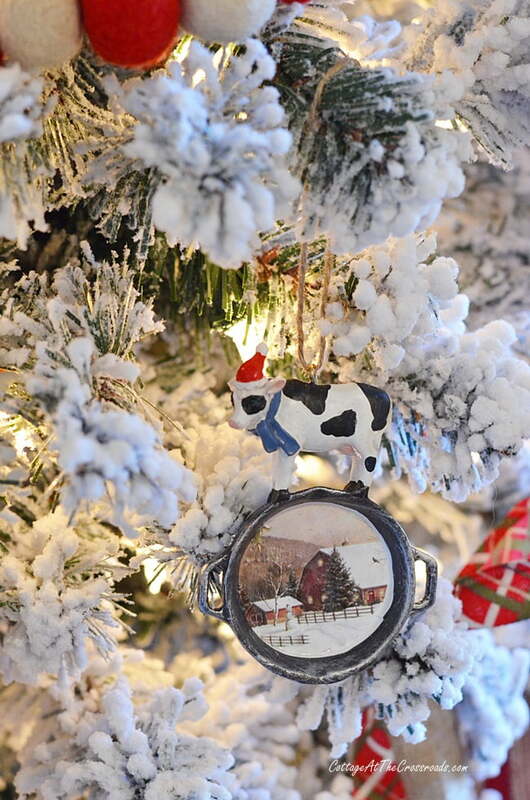 I couldn’t believe my good luck one day when I was scrolling on the online site Zulily when I spied these farmhouse Christmas ornaments with farm animals and cast iron skillets that had photos of red barns inside the skillets! At this point, I knew I was getting quite obsessed with red barns. Have you even gotten that way? So one day I sketched out the red barn from the farm where I grew up and had Leo cut it out to create a wall hanging. I know it’s quite amateurish but working on it brought back many happy memories of my childhood. 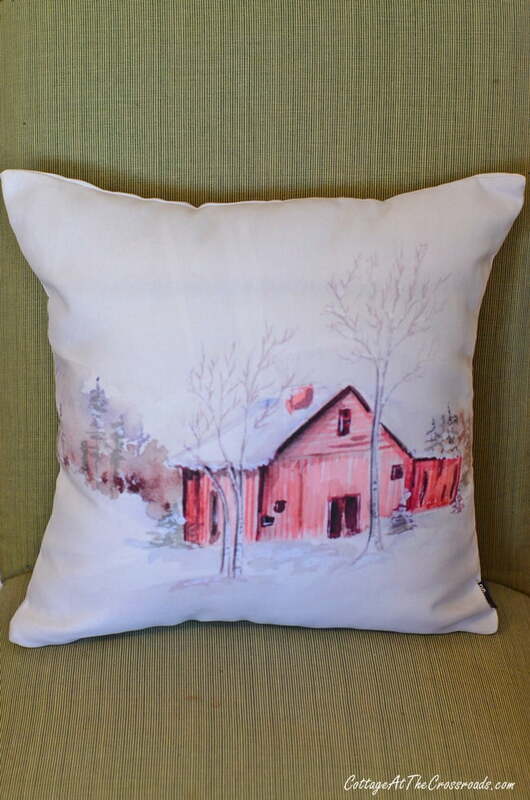 And before I knew it, I had 2 red barn pillows featuring the art work by Lucy from Craftberry Bush. The 2 pillows are in the green chairs that flank our cupboard in the dining room. 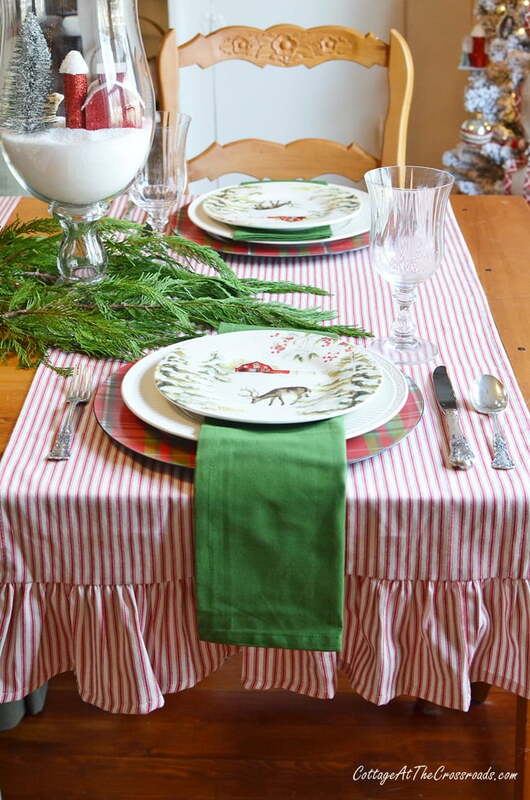 For my tablescape, I pulled out some red ticking runners that I’ve had for several years. Nothing is more farmhouse-y than ticking and plaid but I don’t think most people put them together! The three runners were placed across the table. Here you can see that I was experimenting with using white plates rather than red. Really can’t decide which I like better! 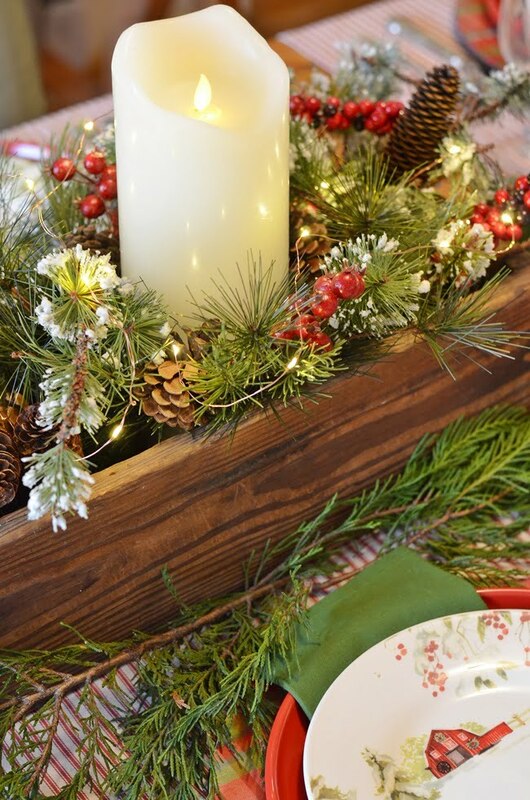 The centerpiece was created in an old pine box that you would definitely find around an old barn. 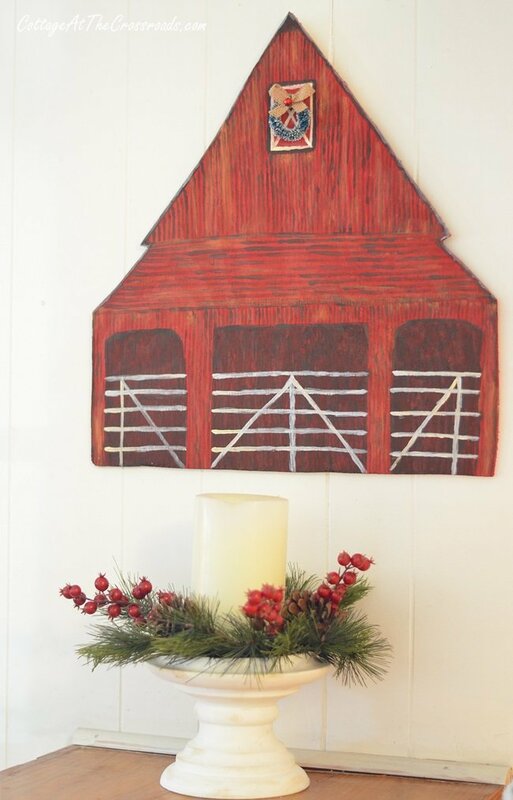 And I created these winter red barn scenes in 2 large candle holders that I have had for many years. The shape of the stemware echoes the shape of the candle holders. Although I used some faux greenery in the centerpiece, I laid some fresh Leyland cypress cuttings on the table and other areas of the dining room. 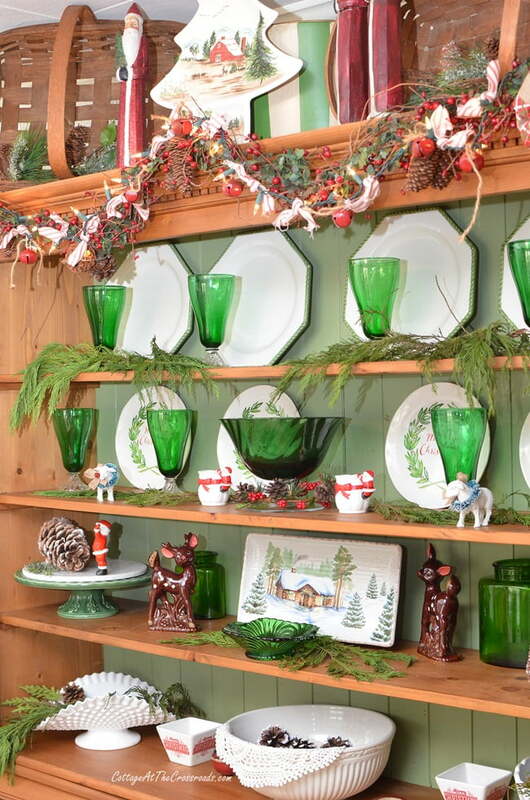 There’s nothing like fresh greenery on a Christmas table! 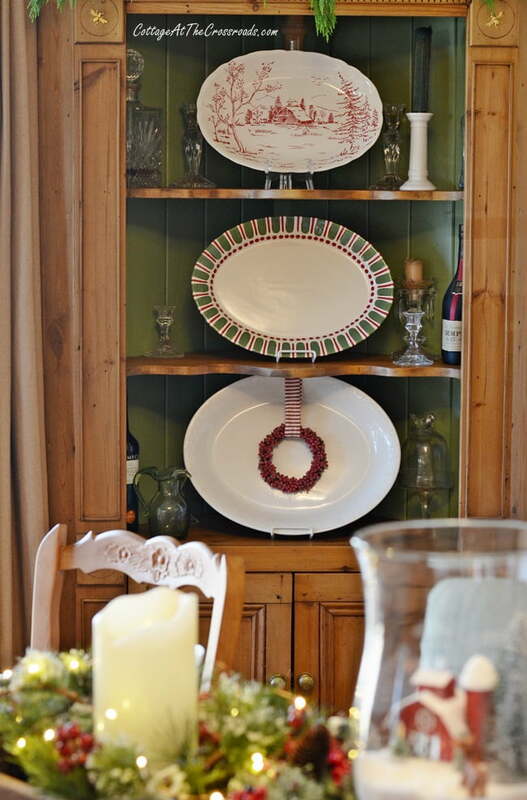 The pine corner cabinet has a display of platters. I had totally forgotten that the red one on top had a red barn scene until I pulled it out of storage! Last week I whipped out this matching red ticking runner from some scraps that I had. 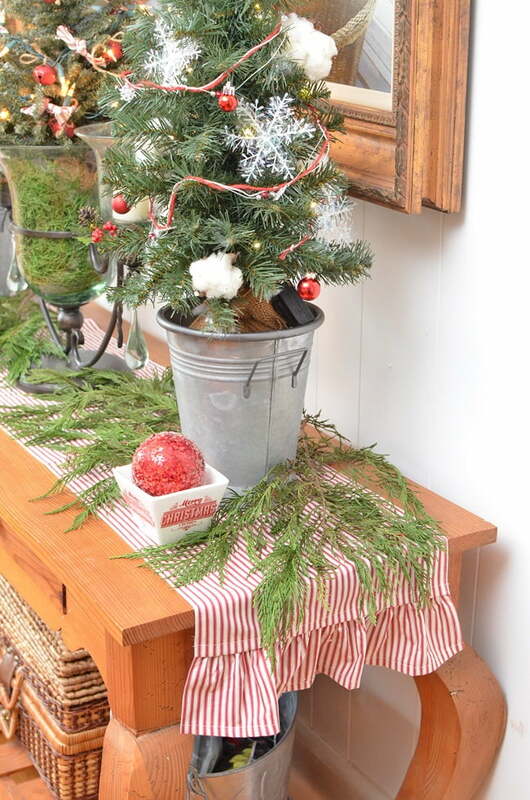 Three trees grace the sideboard with 2 of them tucked down inside galvanized buckets. And yes, that’s cotton on my little trees! Some farmhouse sheep help to create the scene. These little vintage Santa candle holders add some festive flair as well. I placed these large wooden deer on the 2 dividers that separate our dining room from the living area. I just love having the new flocked tree in this corner of the dining room. Santa’s peeking out from behind the red tool box that’s on one side of a divider. And more decorations are on some of the shelves. I’m so glad that I had the tablescape all done this weekend. My niece and her family visited us on Saturday. 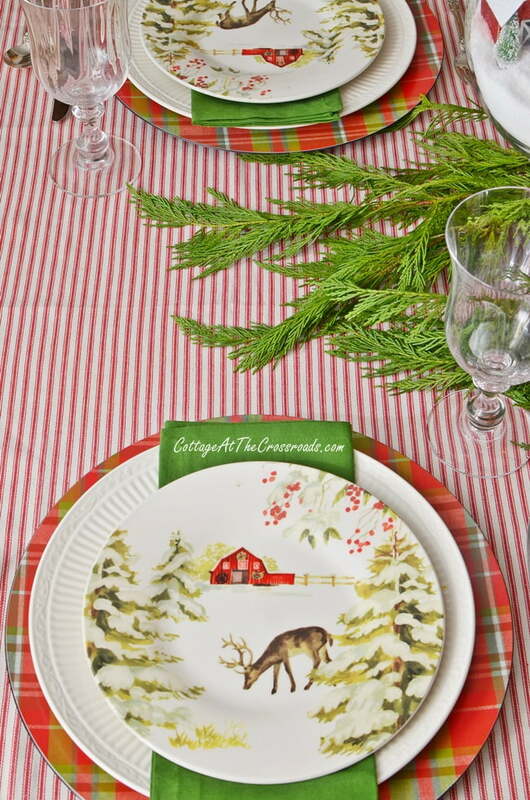 She got a big kick out of this tablescape because she grew up in the same farmhouse that I did with the red barn! 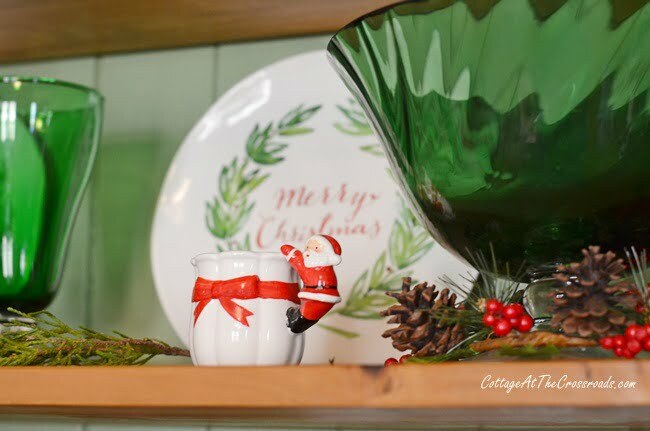 I really appreciate you stopping by to see my red barn Christmas tablescape and indulging me with my latest decorating obsession! Wishing you all the magic that this Christmas season has to offer! What a cheery, cozy home you have! I love all your beautiful farmhouse touches!! I’m inspired for next year. And I have 12 months to plan. It should be a fun year. Your site is awesome. Thank you. 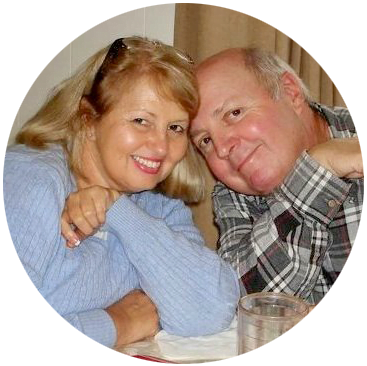 Love you red barn theme, Jane!!! 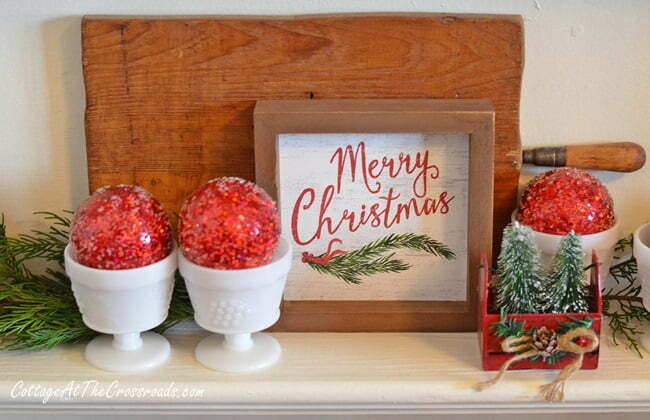 Cutest Christmas decor ever! I’m charmed by your red barns! This is adorable and I too love red barns. 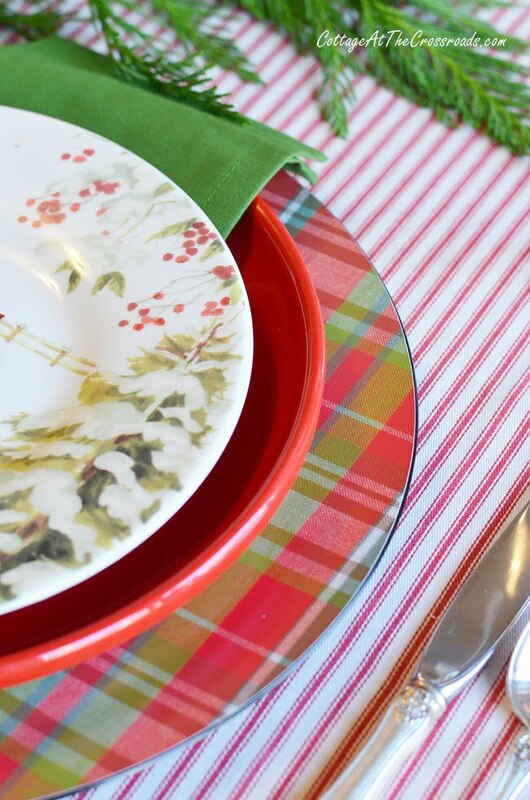 I love your red ticking runners…they look great with the plaid chargers! 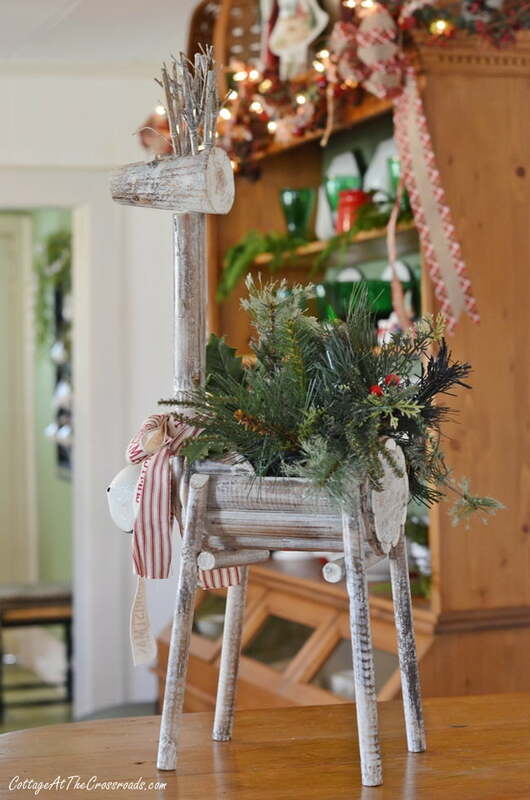 Your vintage reindeer on the hutch are so cute! I love it all, down to the very last barn! I think you truly achieved the look! Very pretty. And this beautiful theme of the Red Barn all began with a wonderful plate!….I am so in love with all that you have done to create such a beautiful table and then taking the theme into the room…..I adore that red barn wall hanging that you created!…It is so wonderful and not in the least bit amateurish!!!! So glad that it brought back such great childhood memories…the best!! 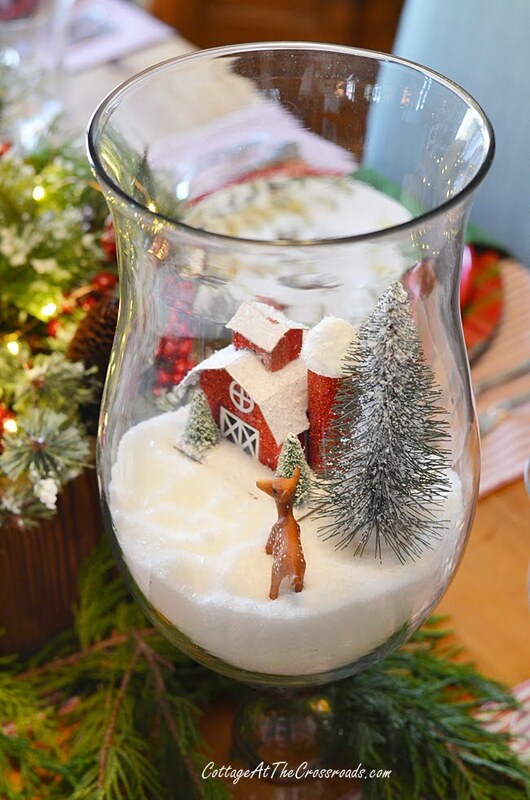 What did you use for the snow with the red barn? I love it..its adorable! Sandra, I used Epsom salt. It works great and after Christmas, you can use it for a soak! Lovely with a lot of thought ! I love all your decorations! Where did you get the green glassware? My aunt had the same ones. Haven’t seen them since I was a child in the early 60’s. Hi Janet, I tried to send you an email but it wouldn’t go through. The glassware was a gift from one of my sisters-in-law last Christmas. She had started a collection and had some extra ones that she passed on to me. They were made by Anchor Hocking in the 50s and 60s and are called boopie glasses! Not really sure why but I have always admired their beautiful emerald green color! You can find them for sale on eBay and Etsy as well as antique stores. 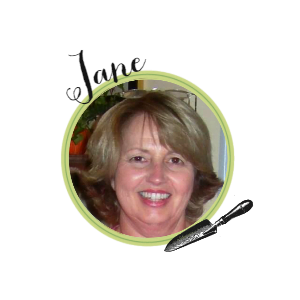 Jane I love your red barn theme! 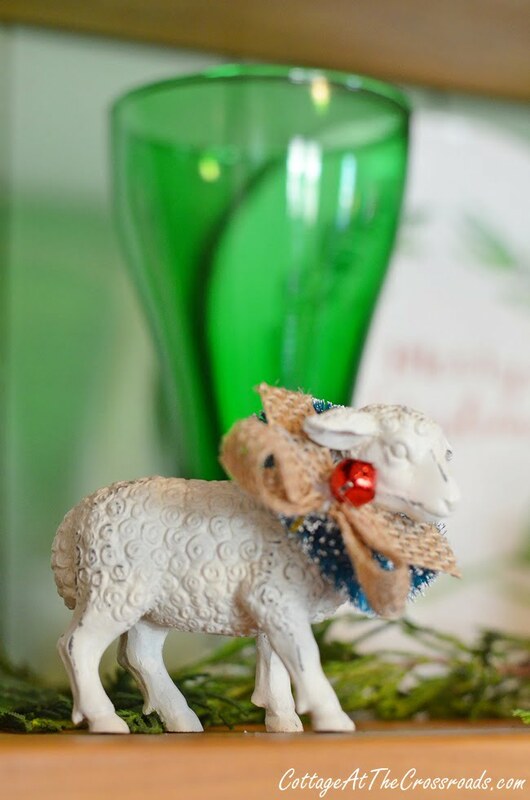 I love every little detail to your décor! How awesome to find the platter you forgot about! It’s so lovely! Merry Christmas to you and Leo! I love your red barn themed dining room. It all looks so pretty and I’ll bet that in person it is even more so. The whole room is gorgeous!!! 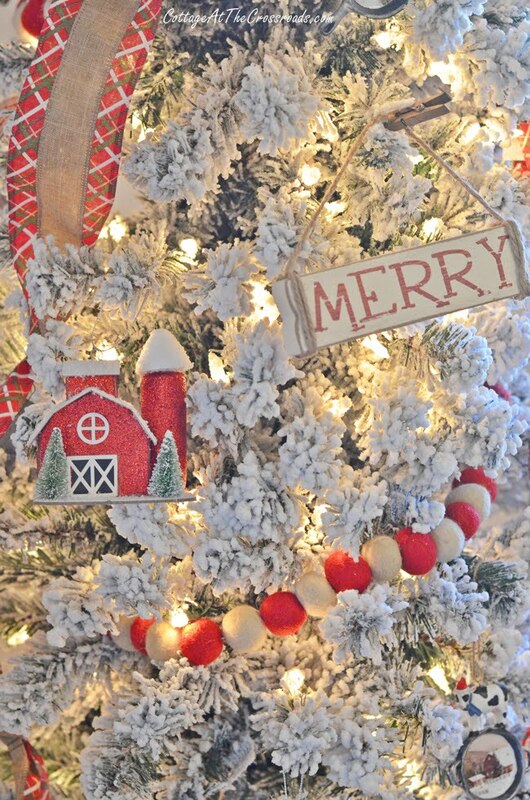 Love the red barn theme and the new tree! I bought a skinny flocked one this year too! 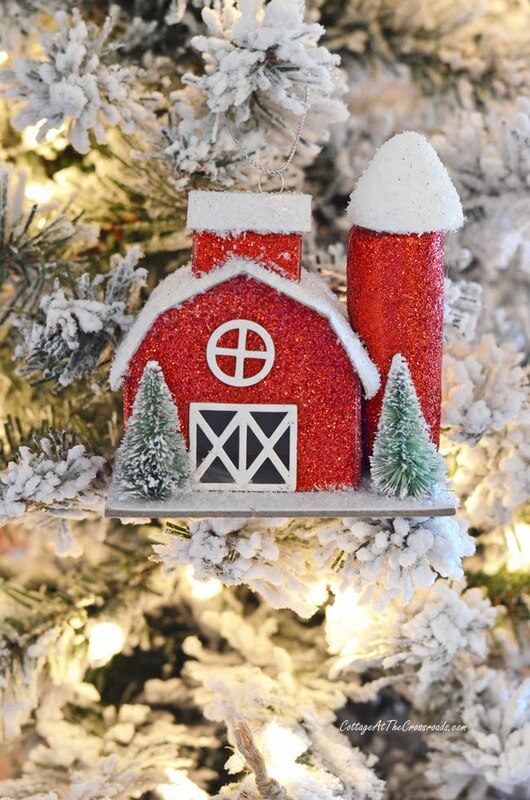 I love the red barn ornament. I searched for it on WalMart, but I haven’t had any luck. 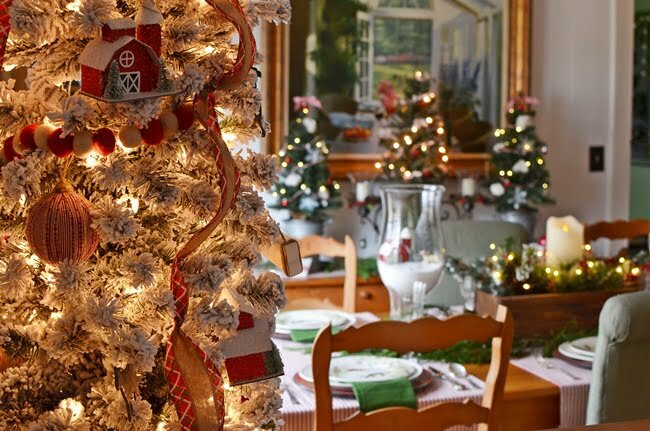 Your Fall dining room was beautiful and now your Christmas one is very warm, festive and has old fashioned feel with the red barns, greenery, animals and the traditional Christmas colors. I love your dining room furniture:). Cute, cute and cute Jane!! We will call you the red barn queen. I love it all! 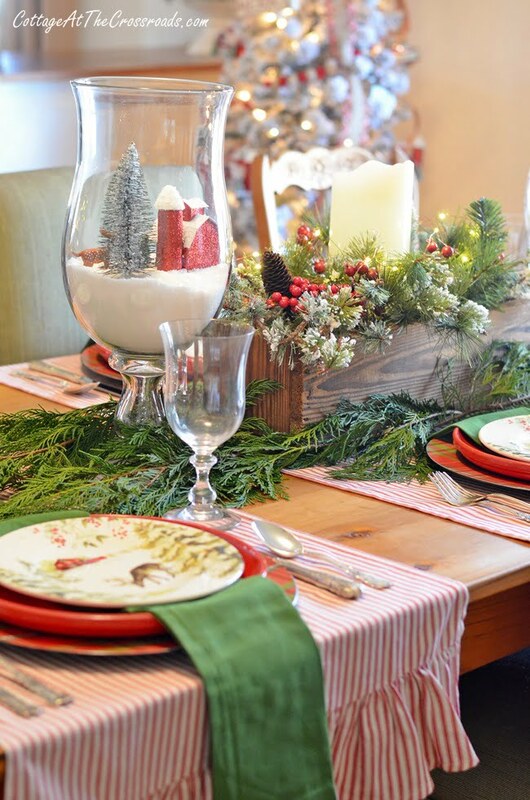 You really did it; how amazingly beautiful; love the dinnerware, the table scape and the whole theme. have a very Merry and healthy Christmas to you and Leo. take care Jane. It’s so beautiful and personal Jane. So many lovely touches and memories. Will we be seeing a barn raising at the Cottage soon? I love the dining room decor!!! I am a barn gal too!!! I just love the red barn theme! 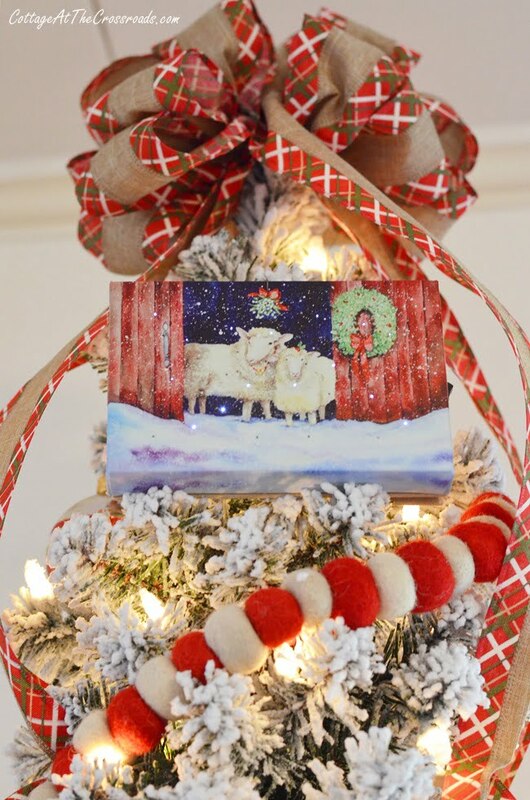 Note to self….look for red barn ornament at Walmart today! You have styled it perfectly and it is whimsical and charming. What fun! I absolutely LOVE your Christmas theme this year!!! So light and airy and inviting!! Merry Christmas! What a wonderful collection . I also love Barns and have quite a few and you gave me a idea about how to display them better . Thank you. 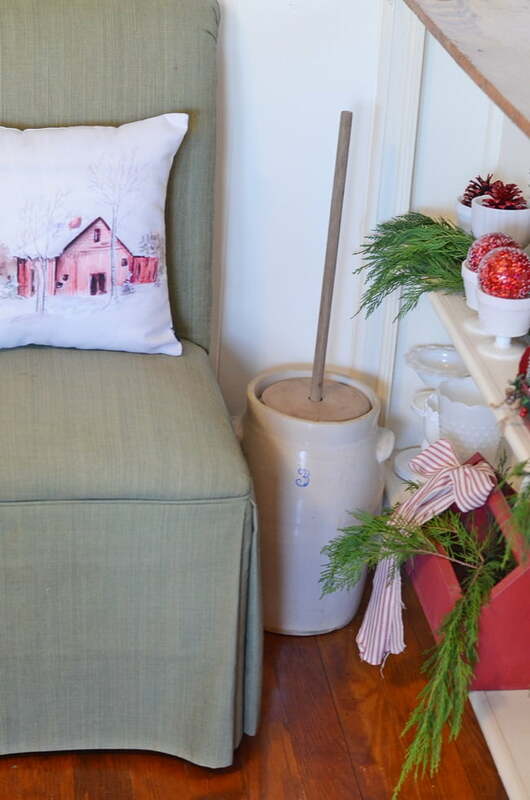 You really are having a red barn Christmas Jane! So adorable!! You are the master of doing a theme. This is going to be my new favorite of yours. It is fantastic. I love your barn theme. It is great. A tornado took out our barn 8 weeks ago and it was so hard on the whole family. Maybe next year I will add red barn decor . Yours is wonderful. I love your obsession with red barns! I too love old barns! Brings back so many memories of home. This decor is perfect for this time of year! Love it! Karen, I purchased the plaid charger plates at Pier 1 this year. I ordered them online after my sister-in-law purchased some when they were on sale. They are plastic and were not expensive at all. I hope you can still find some. Merry Christmas to you and yours! Love all your red barns Jane in your decor. Love it all. Your tree is so pretty. Enjoy this last week before the big day. Funny how you get one piece…then it just morps out of control!!!! Your barn collection looks lovely. I especially like plates ..so comfy and soothing.You could keep these decorations out for awhile. 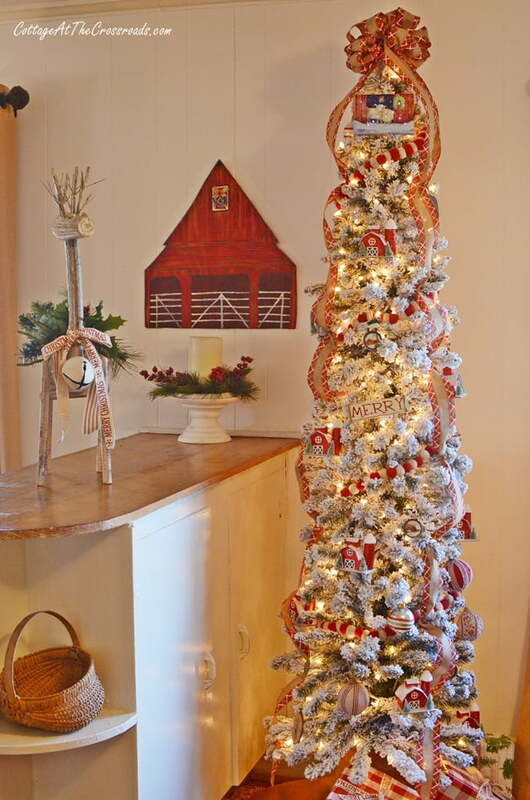 The barn theme is perfect for holiday decorating! Loved the whole room. This year i decorated with a Red barn and red truck nature thing. I love it something different for me, i can so see my collection growing next year. Wow! Absolutely stunning. Thanks so much for sharing. Those pics are awesome and your talent is even more so.